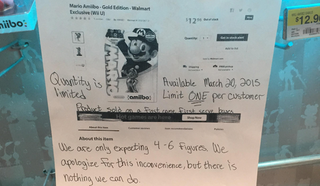 If you're hoping to track down the golden Mario amiibo, this Wal-Mart poster spotted by the amiibo reddit suggests you're going to have a hard time. It's not even out yet, and it's already rare! Good luck!